Yes - I realize that G-Shock's are (still?!?!) all the rage - but similar to investing in the market - it's all about diversification. Step outside the comfort zone - as Nooka just did, with their first circular-designed watch. 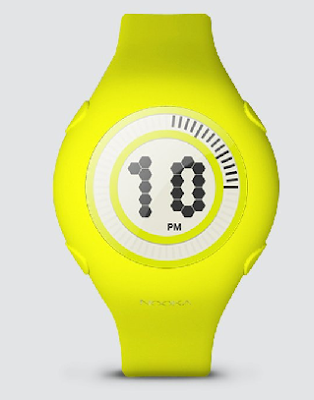 I'm a fan of the siloutte, and once again, Nooka pushes the envelope with regard to their vision on how to tell time. The Yogurt line, designed by the famed Karim Rashid, comes in various colors (fittingly named after flavors - such as Blackberry, Blueberry, Lime Green, Non Fat (Clear), Plain, Rasberry). "Yogurt”, Nooka’s first circular design, will utilize soft and flexible polyurethane, making it similar to the Nooka ZUB line of watches. The display incorporates digital hexagons that comprise the hour in the middle while the minutes circle the outer display of the watch. This watch will feature sleep mode, a 12 and 24 hour display mode.